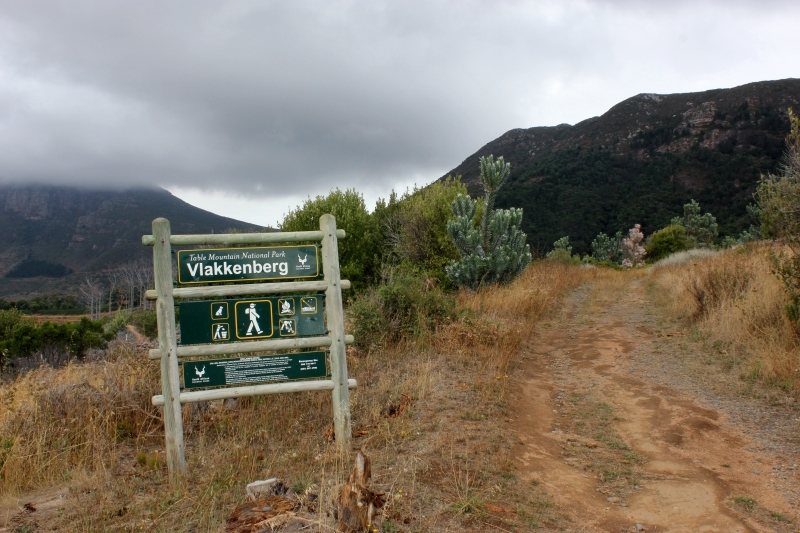 Vlakkenberg peak, within the Table Mountain National Park, is right in the heart of Constantia, linking Price Drive to Constantia Nek. It’s regarded as the seldom visited half of Constantia Nek (access it across the road from the parking at Constantia Nek via a pedestrian gate, partway down the road towards Hout Bay, or conversely from the top of Price Drive). 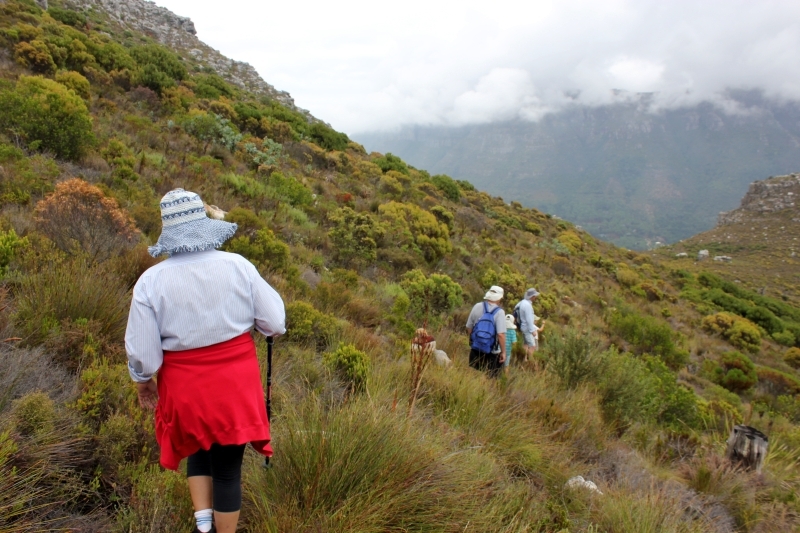 The hike, whilst pretty steep, takes you up Vlakkenberg peak to the summit with views out over False Bay, Hout Bay and Constantia. ‘Ideal weather tomorrow,’ I inform Rob, who organises our hikes, ‘perfect for a walk, as it’s due to rain!’. Whilst this isn’t the standard during summer in Cape Town, when it’s as hot as it has been, days without sun – whilst pretty dire in terms of good photographs – are welcome, and make hiking a pleasure. We access Vlakkenberg via Price Drive in Constantia, having already left one of our cars back at Constantia Nek. It’s hard to believe that you can escape into wilderness so close to residential areas. But in the cul de sac is the typical National Parks sign announcing the reserve. There are a number of versions of the hike. A car at either end will enable you to go up and over, without having to return along the same path. Or, you can start at Constantia Nek and descend via Blue Valley Road into Hout Bay, or start in the same way but make your way back to Constantia Nek via the Hout Bay Pipe Track. If you’ve got kids along, or you’re not particularly fit, take the initial route. It’s a good three hours’ worth of tramping, as the Kiwis would say, and you don’t feel that you haven’t had a workout. Our later descent (to Constantia Nek) joins part of the Hoerikwagga Trail, with carefully laid steps out of local wood and stone that make an ascent or descent a little easier. It’s no less steep than our initial climb from Price Drive, but it’s a lovely introduction to the hike should you start from this side. Our climb up Vlakkenberg from Price Drive is beautiful but a sharp incline – plenty of ‘view’ stops necessary. No-one else on the mountain, other than a couple of beagle males who join us out of nowhere and remain with us, off and on when their noses haven’t taken them off after a rabbit or a mouse, throughout the hike. During the initial climb, which is largely through forest, we notice the number of silver trees that grow on the lower reaches of the mountain. Not only that, but a path has visibly been laid to make it easier for hikers. 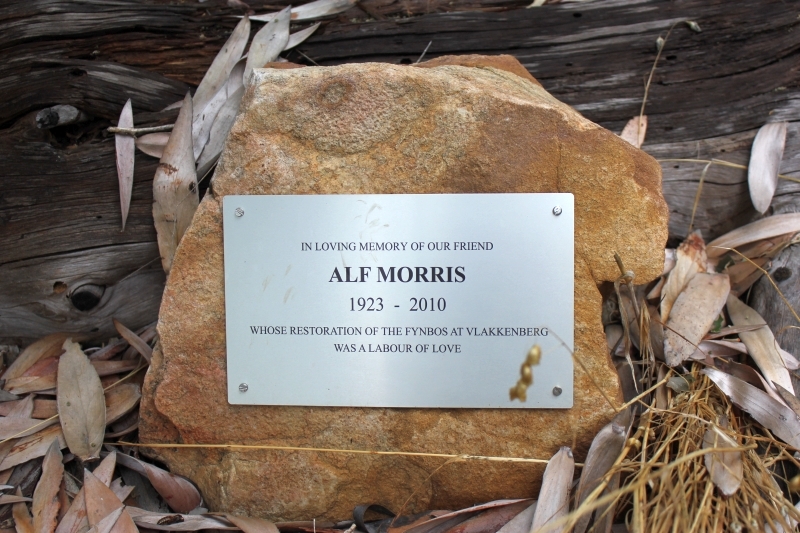 The trees are attributable to Alf Morris whose plaque we come across, tacked to a large stone, about a third of the way up. Alf apparently laboured on these slopes, along with a team of volunteers, to clear a huge amount of alien vegetation, which he replaced as much as possible with indigenous varieties, some of which are labelled – you’ll notice them from the path as you climb. The story I find on the internet, told by Jos De Gendt, explains that about 60 years ago silver trees were all over Vlakkenberg. In spring, it was covered in pink ericas. Then it became heavily infested with aliens, particularly on the Constantia Nek side (this is still pretty obvious). Alf Morris began hacking down aliens as far back as the late 1970s. Others joined the task force and from 1985 he organised a more formal hack. In 2000 there was a massive fire, which got rid of the piles of residue from former hacks. It was severe enough to burn most of the pine and left the mountain looking disastrous – taking a few houses with it. 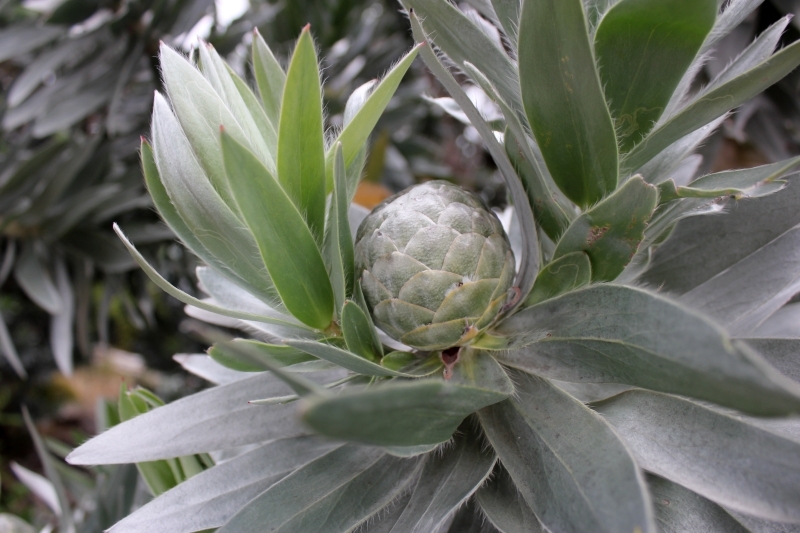 The team used this opportunity to rid the now barren mountain of alien seeds, and plant silver tree sapplings grown in their homes from cones that they solicited from Kirstenbosch. Their labour of love has more than borne fruit. The mountain looks beautiful. But it’s still a work in progress, as any soil disturbance tends to result in alien shootings. Hence a voluntary team hack every third Saturday of the month. A sign partway up outlines how you can join them, if you want to. The paths are thanks to Bob Anderson (where would we be without the generosity of individuals? ), a retired American who has taken it upon himself to maintain and build paths up the mountain. He prefers to work on his own, but the team help by carrying and cutting logs for him to use. Up at the top of Vlakkenberg everything changes. Thick with fynbos, boulders and, I bet, flowers in season, this is a beautiful space in which to stop and picnic. No roads, people or buildings in sight, you’re in the middle of nowhere – and only minutes from home. Views are incredible. The initial walk down from the summit is a little bit of a bundu bash, and you need to keep your eyes peeled for rock cairns as the path is not marked. But it’s fun and easy going. A lovely walk, easy to do early and still have the remainder of the day for other things.